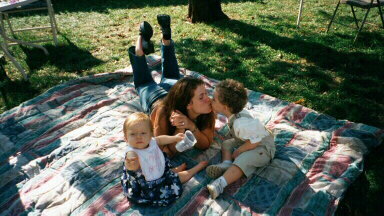 Stealing a kiss with Aunt Dana-Look out Uncle Frank! My March 2000 pal Jonah! I am such a HAM!!!! I insisted on bringing my pillow to Thanksgiving Dinner! Trying to kiss cousin Gina! Is this what a facial feels like Mom?? Gotta love PB&J face! The play area Mom made me in the living room! Like my new Santa hat? I helped Mommy put the tree up this year!! Go ahead Daddy-I will catch you! Look how high Daddy swings me! Although mommy was scared-I am a PRO at this climbing thing! This is Mommy & Daddy in Atlantic City for their wedding anniversary! Please Click Next to see my January 2002 pictures! Man I love to make a mess!!! These are all the presents I got for Christmas!